I was born on the 21st February 1943 in No. 6 Magazine Cottages, Chilworth, Near Guildford, Surrey and it was my home until 16th August 1969 when I married Wendy Hall from 8 Walnut Tree Close, Guildford, we moved from West Surrey to Lingfield in East Surrey. it was only in recent years that I had a telephone call from a gentleman in Tytherington, Cheshire who asked me two questions, (1) what date was I born and (2) where was I born, I answered these and he confirmed that he was an Ambulance man in 1943 and had a call out to No. 6 Magazine Cottages, Chilworth where a mother was having difficulties with her newly born Son, the baby had swallowed some of the afterbirth and was choking. The Ambulance man gave assistance and literally saved my life ! The Ambulance man was Mr George Thompson who at the time lived in New Road, Chilworth. The whole reason for him to contact me was after he had read my blog page and saw my mention of "H.W Thompson & Sons, Electrical & Mechanical Engineers" which was situated very close to Magazine Cottages ! When Mr George Thompson phoned and said to me that he was there at my birth and he had saved my life was a very emotional moment for me. Sadly Mr George Thompson passed away on 15th December 2012, R.I.P. George Thompson, you will never be forgotten as the man who saved my life !! Magazine Cottages were built around 1890 and originally formed part of the Chilworth Gunpowder Factory, hence the name, the cottages were situated down a cart track which led to Old manor Farm which was owned by the Kennett family, they had a Son named Peter and a Daughter named Anne. I can well recall that they used to keep a dairy herd and I often used to go over to the farm with either a milk jug or an empty milk bottle and buy a pint of fresh milk. I can smell the milky aroma that hung in the dairy as if it were only yesterday. I can also remember seeing the cows being walked down the lane when it was time for their milking. At one time they used to keep a pack of Hounds at the farm and the sound of the barking and howling used to drive us mad. 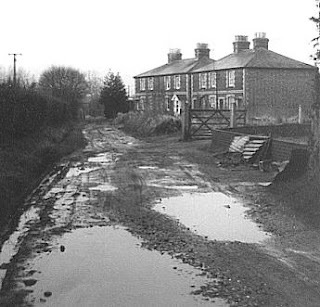 The lane which led down from The Dorking Road to Magazine Cottages was originally the main road to Shalford before the Railway was built in 1849, in the 1950's it was a muddy cart track and after there had been any rain large puddles would form and the ruts would fill with mud and water. At the top of the lane was The Old Manor, which in the days of my childhood during the 1950's was Doctor Gerald Paterson's Surgery. Between the Tangley Level Crossing and the lane, were the allotments where my Dad had a plot, a small stream ran along the edge and under the lane into a pond in Dr Paterson's large garden. This stream was very handy for filling watering cans to water the plants in the allotment. Where the lane widened out was a large red painted corrogated Iron Garage which had a large white painted sign above the large sliding doors, the black lettering stated "H.W Thompson & Sons, Electrical & Mechanical Engineers", Mr Thompson worked in there with Mr Tidy, I can remember going in there one day to try to get our wireless set repaired, when I was presented with an old typewriter to play with. The track split in two just past Thompsons, the right hand fork led to the farm buildings and the back entrance to Magazine Cottages, and the left fork leading to the front way in to Magazine Cottages along a narrow path on the right side of the track to the farm gate. Almost at the end of the track there was an Iron swing gate which we used to call "The Kissing Gate", this led to the cinder path, known locally as "The Linesteps" because it ran beside and below the railway line, then a left turn at the end took you up some wooden steps and over the railway and along the back of the gardens of the houses in New Road, as far as the Prefabs in Hornhatch Estate. I can recall collecting large lumps of coal from the embankment which had fallen from the tenders of the steam trains, this used to burn well in the open fire in our front room. No.6 Magazine Cottages had 3 rooms upstairs and 3 rooms downstairs, you went up a small passage way to get to the back door. If you hadn't got a key you would find it high up on a ledge in the outside loo, a very cold place in the winter! Once inside the cottage, the first room you came to was what we called the scullery, we had one of the low stone sinks with just a cold water tap, a gas stove, I can remember my Mum making Treacle Toffee in a large saucepan. There was also a gas copper for washing the clothes, we also had an old wringer, which I know that I pinched my fingers in, but only the once! There was a step up into the next room, which was known of as The Kitchen, it had one of those old fashioned kitchen ranges which was regularly blackleaded with Zebo Grate Polish, the top of it used to get red hot when we had a good fire going, there was always a kettle steaming away. We used to put the spent ashes along the back garden path. In my younger days we still had gas lighting, with chains to pull which lit the mantles, when we had electricity laid on, we still kept the gas light fittings over the fireplace in the front room. There was a large table in the centre of the room, we had all our meals on this table, also in this room we had an old wind up gramophone it had two doors on the front, which when opened let the sound out, then below another two doors which stored the pile of old 78 records, some I remember had music only on one side, some of the record labels had the name "Regal Zonophone". Under the lid would be a couple of tins of gramophone needles. When the records seemed to a bit more scratched than usual, we would change the needle and imagine that it sounded better. The other form of entertainment other than boxed games was the wireless set, which worked with the aid of accumulators, and I remember them as heavy glass containers that were filled with acid, and whenever they needed recharging were taken up to Mr Thompson in his Garage up the lane, later when Thompson's closed down we had to go all the way to Shalford to Schupke's. There was a cupboard under the stairs, but as it was so very dark, the only time I went in there was when there was a bad thunderstorm going on. As you can imagine, the Front Room as it was always known as was only used on high days and holidays, and the fireplace was only lit during the Christmas period, and memories of the lighting of the fire using large sheets of The Surrey Ad' to cause enough draught to get a really good fire going, and then at the end of the day the unforgettable smell of red hot cinders, scorched lino and singed rugs when it was time for the embers to be carried out of the front room on a coal shovel and into the kitchen to be placed into the kitchen range. When it was time for bed, or "up the wooden hill, or 12 steps and a few yards" as it was often said, the lefthand bedroom was Mum and Dad's, my room was the right hand one, and beyond that, down a couple of steps was a spare room, used by my Brother, Roy when he came home on leave from the Air Force, he was doing his National Service at RAF Cosford. I started going to school in 1948 and remember my first day at Chilworth Church of England Primary School. There was a sand tray in the classroom to mess about with. The Headmistress was Miss Connie Steere. There was a stone over the main doorway of the school building with 1873 written on it. The lavatories were outside in the corner of the playground. Denis Newman, Michael Cannon, Alan Edwards, Howard Brambley. During the summer we used to have Country Dancing in the playground, with music being provided by an old black wind-up gramophone. I can recall the sad occasion when King George V1 died, it was on 6th February 1952, we were all given the rest of the day off school. During the middle of the morning, it was time for the school milk, the third of a pint bottles were kept outside in a galvanised steel crate and on cold snowy winter days, the milk had often frozen at the top and pushed the lid up away from the bottle. The school dinners were delivered in big circular metal containers by van, they were prepared at The Chilworth & District Schools Cooking Centre, New Road. Shopping was mainly done along New Road, first there was Mrs Everett's, The Belle View Stores, The front of the shop was painted a pale green colour, there were a few steps up the bank that took you to the shop door, It was a small shop, with a bell hung on the inside of the door that rang as you opened it. Mrs Everett was usually out the back, and sometimes was quite a while before coming out to serve you. The counter was on the right as you went in and there were glass jars of loose sweets on the shelves. Something that I remember always seeing was an advertisement for Macvities biscuits that showed a picture of a parrot on a stand. I used to call in there for A1 Tobacco and Turf Cigarettes, for my Dad, I used to collect the cigarette cards that had pictures of Railway Engines on them at the time, the cards were coloured blue and white, and were printed on the push out sleeve. I was also allowed to buy some sweets with the sweet coupons (Penny Points) from our Ration Book as sweets were still rationed. This was the shop where we did most of our shopping, The front stated S & A PETTY THE TANGLEY STORES painted in Black and White, there was a Bovril advertisement fixed to the top of the shop window, the shop faced the Dorking Road. They sold all the main grocery and provisions items, The counter was facing you as you went into the shop. Here are some names of food brands that used to be on sale, Brazils Pork Pies, Nevilles Bread, Monk and Glass Custard Powder, Foster Clarkes Lemonade Powder, Lyons Individual Fruit Pies (they were square, with the corners cut off, and had sugar sprinkled over the top and came in a cardboard carton, they cost 6d each) I can remember the Apple and the Apricot ones. Miss Tot Dann, was always serving in the shop when I went in for my copy of The Dandy, The Beano, The Topper or The Eagle. I also bought my pencils and drawing books in there. Some of the newspapers that used to be sold were The Daily Herald, The Daily Sketch and The News Chronicle. They also used to sell the childrens I-SPY books, such as At The Seaside, On a Train Journey, and On The Farm which were 6d each, and those that had a few coloured pages were 1/- each. There was also an I-SPY club which you were able to join by buying a Membership Pack at Dann's which cost only 1/-. The Post Mistress was Mrs Hinds, she also sold Haberdashery items and stationery and toys. On several occasions I was asked if I would deliver a Telegram to one of the local addresses, and was given 6d (Six old pence (two and a half new pence)) for doing so. How times have changed. R W AUSTIN & SON, proclaimed the sign above the shop front of the butcher's in New Road. Sawdust on the floor, combined with the smell of fresh meat gave the shop an unforgettable aroma. This shop later became run by The Holland's and as well as selling groceries was also an Off Licence, I can recall one of the Friary Ales Signs fixed to the wall above the shop. This shop was situated along Dorking Road, just to the left of the footpath where years ago a tramway from the South Eastern Railway Goods Yard at Chilworth Station, led down to The Old Gunpowder Factory. Mrs Bartlett used to sell Grocery, Provisions, Sweets and Cigarettes. Milk was delivered in the area by Home Counties Dairies, but we used to have our milk delivered by H.S.Bowbrick, from Wonersh, I can remember Mr Harry Bowbrick himself with a milk churn and ladle, measuring the milk into our own jug at the door, we used to put a cloth cover over the jug, it had blue beads sown around the edge. He latterly used to deliver the milk in glass bottles, he had a dark green Bedford CA van with sliding side doors. George King, the baker from Albury, delivered Bread in his Horse drawn van, later he used a green three wheeled Reliant motor van which had front forks like a motor cycle. I used to think it was the best bread in the world, as it was so fresh and crusty. Sometimes his Daughter, Susan used to deliver the bread, at times, it used to arrive well after 11.30 at night, and they got to be known as "The Midnight Baker"
We used to walk down Blacksmiths Lane to buy Fresh Fish from the back of a delivery van. I can remember Corona Drinks delivering fizzy drinks in the tall bottles with the wire and ceramic swing stoppers, The Corona Lorry had the crates stacked on the back, they used to collect the old bottles when you bought new ones. The Postman in those days was our own local man, he was Mr Prentice, he lived in a house beside the Chilworth School. One year when delivering my Birthday Cards, he told me his birthday was on the same day as mine, February 21st. During the 1950's and 1960's, there were three bus companies, running single deck buses through Chilworth, each with their own colour scheme. Tillingbourne Valley ex London Transport GS 1 MXX301 and GS 4 MXX304 buses parked outside Chilworth Bus Garage next to The Tangley Stores. The buses were painted Maroon with a grey relief, and fondly known as "The Tilly". The buses were kept at the Garage in Chilworth New Road. The proprieter was Mr Trice, Some of the driver's names that come to mind are, Jim Hatcher, Mr Friend and Mr Tubbs. The route had no route number and ran from Guildford to Farley Green, via Shalford, Chilworth and Albury, the first buses started, and the last buses of the day finished their journeys at The Bus Garage in New Road, Chilworth. 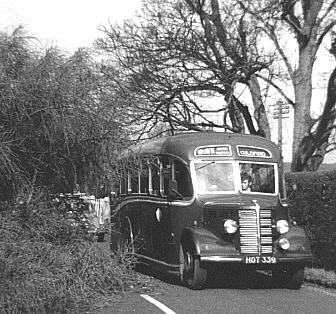 Brown Motor Services Bedford OB Bus HOT339 passing a fallen tree at Tangley Crossing. These buses were run by Mr Brady from the Garage at Forest Green, some local people called the bus "The Brown Baby, The Brownie or The Brady". The buses were coloured Brown with a Cream relief. 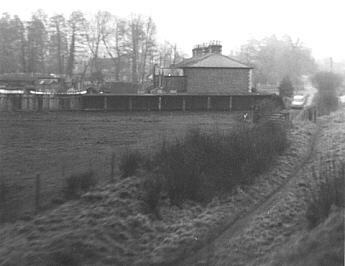 The two hourly service had no route number and ran from Guildford to Holmbury St. Mary and Forest Green via Shalford, Chilworth, Albury, Shere and Gomshall. I can recall a couple of the driver's names, Bert and Gordon. 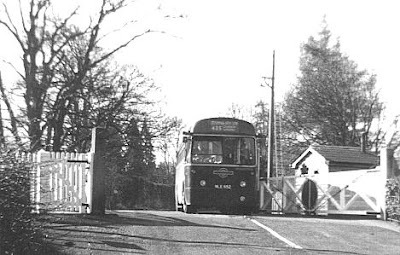 London Transport Bus RF 652 NLE652 at Tangley Crossing. Route 425 operated from Guildford Garage (Code GF) and Dorking Garage (Code DS). These buses were painted Green with a Cream relief. During the summer months, sometimes there would be a Red Bus running, as more buses were needed in those days. The main route ran from Guildford to Dorking, via Shalford, Chilworth, Albury, Shere, Gomshall and Westcott, short journeys, known as swingers, ran between Guildford and Chilworth Station. 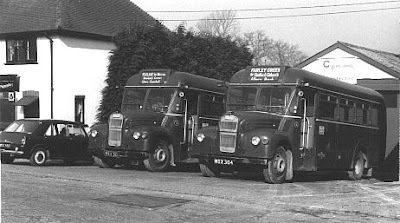 These buses in the 1950's were still known of as "The General" by some of the more elderly local folk, although The London General Omnibus Company had ceased in 1933 when it became London Transport. Many Sunday afternoons would be spent, taking a country walk, and if it was in the summer, a pic-nic would be packed. St Martha's was always a favourite, because of the views. 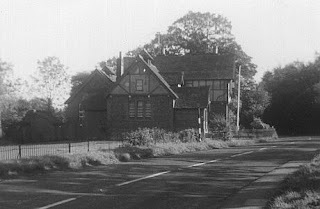 We would set off down Blacksmiths Lane, past "The Waterworks", where Mr Baker worked, you could always hear the "chug-chug" of the pumping engine as you passed by, then it was a lift up to look over the wall at the waterfall before taking the footpath on the left where the road bends at "Corner Oaks". It was uphill all the way up Halfpenny Lane, past the farm entrance that had a picture of a Halfpenny coin on the sign. Finally walking up the sandy tracks to The Church at the top. If we were lucky we would be able to play in the sand pits on the way home. Another walk was down Blacksmiths Lane, then turn right through the Old Gunpowder Works or "The Factory" as we used to call it.. There were remains of several of the old buildings and some of the old mill stones, there were also some of the old tramway sleepers still embedded along the paths here and there. Halfway through, just before where the path crosses a footbridge on its way up to The Chilworth Stores on the Dorking Road, there were a few wooden boarded houses with families still living in them. Our walk usually continued on through "The Factory" and out at the other end where there were some more houses before turning right up the trackway to Lockners Farm, then maybe a slight detour up to the railway bridge to see if a train may be coming, then back home along Dorking Road, past the school and the station. A pleasant walk could be taken by heading along the bridleway at the side of the entrance gates to Tangley Mere, once at the bottom of this track you ignored the right hand turn and took the left hand pathway along the side of the fields and up through the woods, after passing the windmill, taking a path down to the village of Blackheath. A welcome bottle of Purnell's Lemonade or Ginger Beer bought in R.R. Rogers little shop by the Church would keep us going along to the crossroads and straight on past the Volunteer Arms and up on to the heath. A choice of paths will bring us back down to the Crossroads where we can turn right down the hill to Chilworth Station and back home along the Dorking Road.